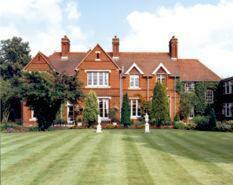 Choose from 37 hotels and guest houses in Cambridgeshire. Shown below a just a selection of the hotels available. To search within an area please use the menu on the right. Following a GBP 1.25 million extension and refurbishment program, this beautifully preserved and maintained 19th century house, with many original architectural features, has been sympathetically transformed into our exclusive, comfortable, city centre hotel. Offering you some of the finest facilities in the region, the Queensgate Hotel offers the comfort and personal service of a country hotel in the heart of the city of Peterborough. New facilities include 30 brand new rooms, complemented by an extensive business facility and excellent dining facilities, including a choice of formal or bar dining and the themed restaurant, Sweet Olives - a Mediterranean food adventure. To complete the services available, the Queensgate offers a Beauty and Wellness Centre where you can relax in warm inviting water or choose one of the beauty and massage treatments. Willingham House is a 4 Star Luxurious Victorian period house set in three acres of superbly landscaped gardens in the Picturesque Village of Willingham , 9 miles from the historic University City of Cambridge.We have 22 executive en-suite bedrooms, restaurant and bar, free parking. Restover Lodge Hotel Peterborough is a great choice for cheap hotel accommodation whether you are travelling for business or leisure. The hotel offers comfortable, clean accommodation in a convenient location in Peterborough, with good access to the region's road network and within walking distance of the town's train station. The Restover Lodge offers a cheap and friendly alternative to expensive hotels, motels, guest houses and bed and breakfasts. The rooms are modern and cleverly designed. Each one has one double bed and a bunk bed over the double bed. Every room has a washbasin, a mirror, a corner table and a TV. Shared shower and toilet facilities are located just down the hall from your room. Smoking rooms are available. Set within 11 acres of attractive grounds, Peterborough Marriott Hotel is opposite the East of England Showground and close to the A1, boasting a range of contemporary leisure facilities.. Unwind in the Leisure Club, with its indoor swimming pool, children's pool, sauna, and whirlpool. Enjoy international cuisine in Source Grill, or have a snack or cocktail in the Senses Lounge, which is the perfect place to catch up with colleagues and friends. The hotel is close to many area attractions, such as Nene Valley Railway and Queensgate Shopping Centre. Hotel Felix has 21st-century style, modern designs and luxurious accommodation in a relaxed and informal setting about a mile from Cambridge city centre. Graffiti restaurant overlooks the hotel's terrace and garden, and serves modern Mediterranean cuisine. Hotel Felix has easy access to business parks, the M11 and the A14 North. There is free on-site parking. The bedrooms are opulent yet simple and each has a king-size bed, a flat-screen TV, fresh milk and Egyptian cotton linen. Some bathrooms have a walk-in rain shower. In a tiny village south of Cambridge, this appealing 16th-century freehouse has an AA Rosette restaurant, an atmospheric bar, and new-build en suite rooms with free internet. The Red Lion is a Grade II listed building with a walled garden overlooked by a dovecote and village church. You will find beamed ceilings, log fires, cask ales and seasonal menus within the bar and restaurant. The Red Lion Hixton is recommended by Alastair Sawday, and is convenient for Cambridge University, Duxford Imperial War Musuem and the M11. Opened in 2009, the air-conditioned Days Inn Peterborough is just off junction 17 of the A1 at Peterborough Service Station, 7 minutes from central Peterborough. Every spacious room at Days Inn Peterborough is air conditioned, with an en suite power shower. Contact the hotel after booking to arrange early check-in (from 11:00) or late check-out (until 14:00) at an additional cost. 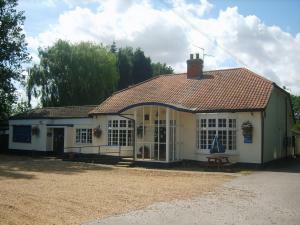 This Days Inn hotel is well placed for Hamerton Zoo Park and the East of England Showground. The location at the service station means guests have easy access to a variety of shops and food outlets. 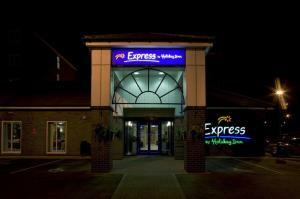 The hotel is adjacent to the East of England showground and 1 mile from the A1(M) with easy access to the city centre. The Express by Holiday Inn Peterborough is a modern hotel conveniently located one mile to the East of the A1(M) and four miles from the city centre adjacent to the East Of England Showground. The hotel offers 80 well-equipped modern bedrooms, with children up to 19 years of age staying free when sharing a room with their parents. Each bedroom has en-suite bathroom with power-shower, direct dial telephones, modem access, hairdryer, tea and coffee making facilities, colour TV with pay movies and satellite channels. Business facilities include photocopying and facsimile services, available on request at reception. The hotel has ample free car parking. Our hotel is designed specifically for business and leisure travellers who want to 'stay smart' at great value-for-money per room prices. You'll find the Express by Holiday Inn Peterborough is the ideal base from which to visit the city centre of Peterborough and its Cathedral where the first Queen of Henry VIII, Katharine of Aragon, is buried. Other attractions and places of interest nearby include Burghley House, Nene Valley Railway, Flag Fen (Bronze Age) Excavations, Peterborough Football Club and Thorpe Hall. Duxford Imperial War Museum and Cambridge City Centre are located within 45 minutes drive from the hotel. Oliver's Lodge Hotel offers a warm and friendly welcome to guests, whether staying for business or pleasure, with individual attention to guest's requirements and an enviable reputation for high quality food and service. Oliver's Lodge Hotel is just two minutes walk from the centre of St. Ives and the Great Ouse river and twenty minutes from the city of Cambridge. Independently owned and family run Oliver's Lodge Hotel offers an extensive restaurant menu featuring fresh fish & game in season. This new, stylish hotel in Peterborough city centre is 5 minutes' walk from the railway station and has secure on-site car parking. Cafes, restaurants, clubs and bars are all close by, along with shopping areas and the cathedral. RBG is the hotel's grill restaurant and bar, located on the ground floor. Also on the ground floor are 3 modern meeting rooms with natural light, Wi-Fi and a large breakout area. This modern, recently refurbished, air conditioned hotel is the ideal choice for business or pleasure, located just 5 minutes from the city centre. Holiday Inn Peterborough West stands opposite an 18-hole golf course and is surrounded by 500 acres of parkland. It is an ideal base to visit some of this country's finest stately homes including Burghley, Sandringham and Althorp. The hotel offers beautifully appointed bedrooms and a recently refurbished bar and restaurant, offering fine dining in a relaxed and informal atmosphere. The superb leisure centre is one of the finest and best equipped in the area and is available free of charge to residents. Nestling on the Bedfordshire/Cambridgeshire border, Wyboston Lakes is set in 350 acres of picturesque countryside among lakes and alongside the banks of the River Great Ouse. Easily accessible by road, rail and adjacent to the A1, it is the ideal venue for a midweek stay or a relaxing weekend break. Wyboston Lakes offers high standards of accommodation (AA 3-star rated) and superb food prepared by award-winning chefs. The on-site Waterfront Brasserie overlooks the south lake and has a waterside patio. The 18-hole golf course, on-site leisure facilities and recently refurbished bedrooms provide the perfect opportunity to relax and unwind after a busy day. There is ample free on-site parking. On the A15, in the north of Peterborough, this Premier Inn provides the convenient and comfortable facilities you would expect, including an on-site Table Table pub-restaurant. Peterborough Train Station and the cathedral are about 2.5 miles (4 km) away. You can park for free at Premier Inn Peterborough North. Some rooms at Premier Inn can take 2 adults and up to 2 children (under 16 years). The 2 children also get a free full breakfast when accompanied by an adult eating a full breakfast. The full all-you-can-eat breakfast has the expected cooked items, including vegetarian sausages, as well as a wide continental selection. In the heart of Peterborough, close to the cathedral, the railway station and opposite the modern Queensgate shopping centre, this exclusive hotel offers high-quality accommodation and free parking. 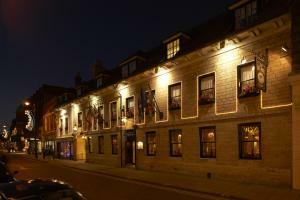 The Bull Hotel has a great location, right in the heart of the city centre, just minutes from Peterborough's Norman cathedral and the bus and railway stations. There is free parking for over 100 cars. Originally dating back to the 17th century, this Grade II listed building has been carefully restored and renovated, and now boasts 118 well-equipped en suite rooms. 62 of the rooms have been refurbished to executive standards and feature air conditioning, minibars and power showers. Pastroudis bar and lounge is open throughout the day and the brasserie serves traditional, as well as more contemporary dishes. Free Wi-Fi is available in the hotel's public areas and the hotel also has an independent air-conditioned conference centre boasting state-of-the-art technology. 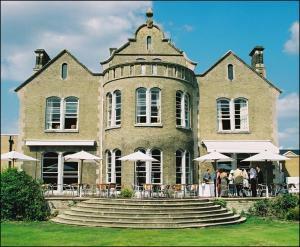 One of Englands finest coaching inns, dates back to 1620. Its impressive fa?ade dominates the idyllic stone village of Wansford near Peterborough, set in unspoilt countryside on the banks of the River Nene. Our luxuriously decorated bedrooms, outstanding restaurants (a la carte and brasserie), fully equipped business centre, private meeting rooms and ballroom to accommodate up to 250 guests. You can look forward to a warm welcome offered by friendly and professional staff. Just a 15-minute riverside walk from the heart of Cambridge's city centre, this charming guest house offers free Wi-Fi, free parking and comfortable accommodation at great-value rates. Lantern House has a convenient location, just a few hundred metres from the River Cam and about a mile (1.6 km) from the city centre. Many of Cambridge's famous colleges are just a short walk away and the heart of the city can be easily reached on foot, by crossing one of the beautiful greens. Regular buses are available nearby for those who prefer not to walk. The hotel offers a range of accommodation to suit the needs and budget of any traveller. En suite bathrooms and rooms with shared bathrooms are both available. All rooms have TVs and tea/coffee. A full English breakfast is available every day. This family-run establishment is approximately one mile from the centre of the city, providing an ideal base from which to see the many attractions Cambridge has to offer. Situated on a bus route, Iceni House is also a 20-minute walk from the Market Square. The house has always been non-smoking and enjoys a 4-star grading. 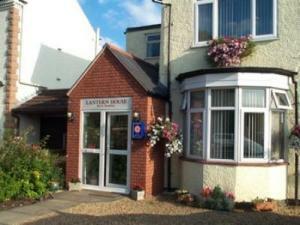 The rooms are all en suite except for two which share facilities with one another. All are individually decorated to a high standard, with cleanliness being a priority. Each room has all the comforts you would expect. This brand new hotel offers great value, with bright, modern, air-conditioned rooms and free parking, just 3 miles (5 km) from Cambridge city centre and only metres from the A14. The Premier Inn Cambridge A14 J32 has a great location, with easy access to the region's major roads and all that the historic city of Cambridge has to offer, including the museums and the ancient colleges. Newmarket Racecourse is an easy 15-mile (24-km) drive away and the Cambridge Science Park is less than 1.5 miles (2.5 km) away. There is a convenient bus service into the city every 20 minutes. All of the large, clean and modern rooms are fully air conditioned and soundproofed against external noise. 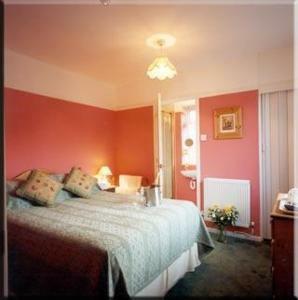 The rooms have hairdryers, tea/coffee making facilities and TVs with Freeview digital channels. Wi-Fi is available at an additional cost. The on-site restaurant and bar offers good food and drink at reasonable prices and an all-you-can-eat breakfast buffet is available each morning. Privately run, this hotel has free Wi-Fi, free parking and a free full English breakfast. The bar serves real ale; the cosy restaurant serves fresh food and has a real log fire. The Sibson Inn Hotel is in Peterborough, with easy access to the town centre, as well as Stamford, business parks and the East of England Showground. Enjoy freshly prepared, quality meals and good wine. 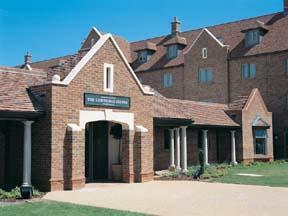 The Sibson Inn has conferences facilities, function rooms and a wedding license. 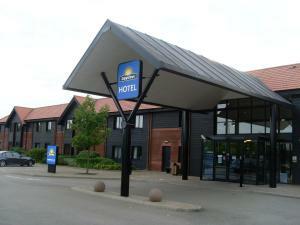 Opened in 2009, the air-conditioned Days Inn Cambridge is just off the A14, 6 miles (9.5 km) from Cambridge city centre. There is a 24-hour reception and free parking. Every spacious room at Days Inn Cambridge is air conditioned, with an en suite power shower. Contact the hotel after booking to arrange early check-in (from 11:00) or late check-out (until 14:00) at an additional cost. Days Inn Cambridge is an affordable choice for a visit to Cambridge, Peterborough, Huntingdon, Newmarket or Duxford. Stansted Airport is a 40-minute drive away. There are 4 disabled rooms on the ground floor, which can be requested when booking. Set beside a country park and Orton Meadows Golf Course, Peterborough (Ferry Meadows) Premier Inn is 1 mile from the East of England Showground. 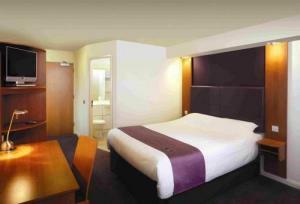 The Premier Inn has comfy beds in every room, an on-site Beefeater restaurant and free car parking. Some rooms at Premier Inn can take 2 adults and up to 2 children (under 16 years). The 2 children also get a free full breakfast when accompanied by an adult eating a full breakfast. The full all-you-can-eat breakfast has the expected cooked items, including vegetarian sausages, as well as a wide continental selection. The Unicorn is a charming pub with rooms just south of Cambridge city centre. It has a 40-seater restaurant and some original parts dating back to the 17th century. 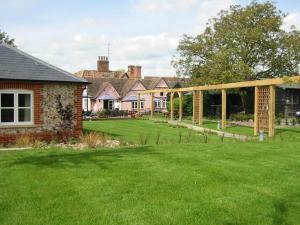 The main pub has a large garden with facilities for 120 people, and a children's play area. The en suite rooms are in a separate annexe designed in keeping with the original building. The city centre is easily accessed by bus. In a peaceful location, just 8 miles (12 km) west of Cambridge and only minutes from the M11 motorway, this 4-star hotel offers beautifully appointed rooms and great leisure facilities. The hotel has a beautiful, tranquil location, at the gateway to the village of Cambourne, with views across the lake. The convenient location means the hotel also offers easy, convenient access to the region's major road network, with the M11 and the A14 just 6 miles (10 km) away. The Cambridge Belfry has a wide range of excellent leisure facilities including a heated indoor swimming pool, an all-weather floodlit tennis court and a well-equipped gym. There is also a spa with a steam room, a sauna and spa treatment rooms offering a range of relaxing and therapeutic spa treatments. All of the rooms are stylish, modern and comfortable. Each elegant room is beautifully appointed with contemporary facilities, including tea/coffee making facilities, satellite TVs, DVD players and hairdryers. Wi-Fi wireless internet access is available throughout the hotel and each room comes with 2 hours of internet access free of charge. The Bridge Bar and Restaurant has received 2 AA Rosettes for its delicious food and the high quality of the fresh, locally sourced ingredients it uses. Just off the A1, within easy reach of the very heart of St Neots' town centre and Cambridge, the hotel offers great value, with free parking and spacious, modern en suite rooms. The Premier Inn St. Neots (Colmworth Park) has a convenient location with good access to the region's major roads. The centre of St Neots is only 2.5 miles (4 km) away and Cambridge's city centre is about 18 miles (29 km) away. The hotel has a 24-hour reception desk and some rooms can take 2 adults and up to 2 children (under 16 years). The 2 children also get a free full breakfast when accompanied by an adult eating a full breakfast. An all-you-can-eat buffet breakfast is available each morning and includes scrambled, fried, poached or boiled eggs, and pork or vegetarian sausages. There is also a wide continental selection. The on-site Brewers Fayre restaurant offers traditional, great-value pub favourites in a family-friendly environment. This elegant Grade II listed country house is set in 55 acres of parkland on the banks of the River Cam, within easy reach of Cambridge, Duxford Airfield, the M11 and Stansted Airport. The Wellcome Trust took over the Hinxton Hall site in 1992 and since then the house and estate have been lovingly renovated and imaginatively adapted for their current purpose. Today, the site provides state-of-the-art conference technologies and attractive, modern en suite accommodation in a beautiful peaceful setting. Situated in a delightful rural idyll, Hinxton Hall boasts 72 rooms, 62 of which are in the residential court and 10 of which are in the Grade II listed Hinxton Hall itself. Just minutes from junction 9 of the M11, the site has a convenient location with good access to the region's major road network. 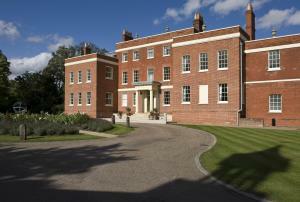 Please note that Hinxton Hall offers high quality guest accommodation but is not a hotel. This hotel enjoys a prime location in the heart of the city centre, walking distance from Kings College and the many universities, with easy access to Cambridge Business Park. High speed internet access and Wi-Fi are offered in all bedrooms, meeting rooms and hotel's lounge. The Fitness Room offers cardiovascular and muscle-toning equipment, with a sauna and solarium also available. The conference centre has 4 well appointed meeting rooms ideal for business and social events. 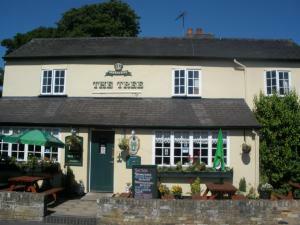 The Tree Guest House is a pub and restaurant in a small village 5 miles south of Cambridge. There are frequent buses from Stapleford to Cambridge city centre. Stansted Airport is 20 minutes away and a main line train station is within walking distance. Home-cooked meals are available for breakfast, lunch and dinner. Just off junction 32 of the A14 and only 2 miles (3.2 km) from Cambridge's city centre, this modern hotel offers great value with free parking, air-conditioned rooms and an indoor pool. The Holiday Inn Cambridge has a convenient location with excellent access to the region's main roads. Newmarket Racecourse, Duxford Imperial War Museum and all of the attractions of historic Cambridge, including the city's ancient colleges, are within easy reach. All of the air-conditioned rooms have satellite TVs and a sofa bed that can accommodate up to 2 children under 12 years of age, free of charge. High-speed internet access is available at an additional cost. The hotel's own on-site health club has a 15-metre indoor pool, a well-equipped gym, a jacuzzi, a sauna, a steam room and 2 beauty treatment rooms (advance bookings are required). The hotel offers 24-hour room service, a full-service restaurant and a relaxing bar and lounge.